Babyloid is a robot whose purpose is to relieve the psychological distress in elderly patients and patients needing long-term care by having them take care of it. Unlike general robots, which seek to be able to do all tasks in the manner of human beings, Babyloid was designed so that it cannot do anything. However, it tries to satisfy its self-sufficiency by expressing psychological and physiological states through crying, showing bad mood, etc. M. Kanoh, “Babyloid,” J. Robot. Mechatron., Vol.26, No.4, pp. 513-514, 2014. M. Kanoh and T. Shimizu, “Developing A Robot Babyloid That Cannot Do Anything,” J. of RSJ, Vol.29, No.3, pp. 76-83, 2011 (in Japanese). 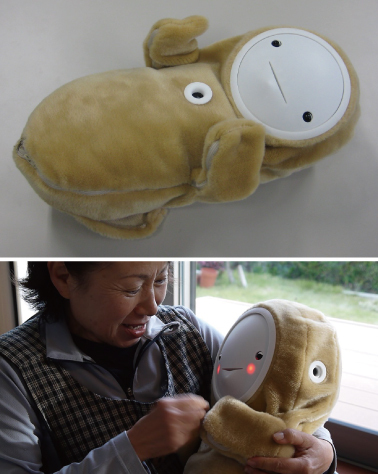 K. Wada and T. Shibata, “Living With Seal Robots – Its Sociopsychological and Physiological Influences on the Elderly at a Care House,” IEEE Trans. Robotics, Vol.23, No.5, pp. 972-980, 2007.